The results of a research paper are written up as a full report or short note. The state of the available literature on a topic can be summarized in a review paper, which ideally contains some synthesis. A new idea can be written up as an opinion piece or editorial. Though many students don’t think about this, it is entirely possible that if a topic is specific or novel enough, you may be the most knowledgeable person in the world! A literature review made for a thesis or dissertation proposal or an original term paper may make a great review paper if properly modified. Technical writing of the sort that should be featured in scientific papers is very different from other types of writing. The best way to get a sense of it is to read a lot of papers, which you should already be doing as a student. Although these papers should be formal and technical, it is important that they are still readable and understandable, with some degree of coherent narrative. Your personal voice and writing style can shine through here as long as you follow basic guidelines. Due to journal word limits and audience attention span, not every detail of every project can (or should) be included in a paper. Some less critical information will be cut entirely, but if there’s enough information cut out, it may be enough for a separate paper entirely. There are nine general components to a scientific paper: the title, the abstract, the introduction, the methods, the results, the discussion, the acknowledgments, and the references. There are different requirements and strategies for each, and each requires thought and attention. Many students are familiar with the abstract, introduction, methods, results and discussion, but may have put less thought into the other areas. The title should be relatively brief, but also clear and informative. Readers should be able to tell from the title what your paper is about, and whether it is something that they want to read. If your title is in the form of a question (which some reviewers are strongly opposed to,) that question should be explicitly answered in the discussion section. Some papers have cute or clever titles, including things like “size does matter” or, in the case of a recent shark ecotourism paper by our lab, “don’t bite the hand the feeds,” but some reviewers don’t like this. The title can always summarize a key result of the paper. The abstract is a 200-300 word summary of the entire paper, including some background, some methods, some key results, and some significance. When a paper is not “open access” (more on this later), then the abstract is the only part of your paper that many potential readers can see, so it should contain what you consider the most important information from your paper. Even when people can read the whole paper, many only read the abstract. Here’s a post on how to write a good abstract for a scientific conference, which is very similar. The introduction contains background material that potential readers would need to know in order to understand the paper. Depending on how general in scope the journal is (more on this later,) you should have a general idea of what background knowledge to expect from your audience and tailor your introduction based on that. Introduction sections should cite appropriate background literature to make make a point; whenever possible this should be the earliest paper that makes a particular point. The methods are where you explain what you did. They should be detailed and specific enough for someone otherwise unfamiliar with your research to duplicate your study. They can include figures (often a map of a study site or a diagram of research equipment) and references (we performed this common method following Smith 1989). They should include the specific statistical methodology that you used to analyze your data. The results are where you report what you found. This often includes tables and figures, as well as the results of statistical tests. For ease of readability, this is often in the form of a general summary sentence followed by specific numbers. If there are lots of results that aren’t critical to the paper, extra tables can be included as optional appendices. Statistics can be reported in tables to make the text flow better. A good figure goes a long way towards making your readers easily understand your most important result. The discussion is where you explain the significance of what you found. Your results should be compared to other similar papers, and put into the context of your field. They should include any gaps or limitations associated with your study, but you don’t really need to say “more research is needed” because that’s true of almost everything. You can also broadly speculate about what your results may mean, as long as it is abundantly clear that you are speculating and not exaggerating what your results actually mean. The acknowledgments section is where you thank people who helped, but not enough to be full co-authors. Many people thank their anonymous peer reviewers. You should also acknowledge your sources of funding, which is relevant in terms of conflicts of interests, and list your permit numbers. Authorship of the paper is an important consideration as well. If you are a student and the paper is based on your thesis or dissertation research, you should be the lead author and your adviser should be the last author. People who contributed in some significant way to the development of the research project or paper based on it (committee members, colleagues, etc) should be listed as co-authors. Check out this thorough discussion of authorship issues by Chris Parsons. There are tens of thousands of peer-reviewed scientific journals (all scientific disciplines, not just marine science), with hundreds of new ones released every year. It is very possible that for any given paper, as many as dozens of different journals might be a good home for it. For example, since 2012, my lab has published 46 papers in 37 different journals. Some journals are very general in scope and publish work from a variety of different disciplines, while others are very specific. Any journal’s website has a set of “author guidelines” or “instructions to authors” featured on the homepage, and it should be clear from that whether your manuscript might be a good fit. If it isn’t clear, you can always e-mail the editor and ask. A journal’s impact factor is a proxy for journal prestige. It basically measures how relatively likely it is that a paper published in that journal will be cited compared to other journals. Journals typically display these impact factors prominently on their website, and a list of all of them, organized by discipline, is released every year. Impact factor is somewhat controversial in some circles, because most articles these days are shared independently of what journal they are published in, but many hiring committees and grant agencies still care about these. The three journals with the biggest impact factor (and are often considered the most prestigious, and the most widely read) are Nature, Science, and the Proceeding of the National Academy of sciences. These are also the most general in scope but focus a lot of biomedical science and astronomy. I often don’t know what words in the titles of many of their papers mean. You are not paid when your paper is published in a journal. In fact, you often have to pay a publication fee of some kind, or sometimes an extra cost for color graphics. In a traditional publishing model journal, the rest of the journal’s costs are covered by University library subscriptions; a University library pays a journal so that University employees and students can read those papers. People without University library access (i.e. most of the people in the world) cannot download or read that paper without paying a separate fee, often $20-$50 per paper. In contrast, open access journals are free for anyone to read or download regardless of whether they have University library access; the journal charges the authors a fee to publish that paper to help offset costs. This fee is often around $2,000 and sometimes as high as $5,000. There are some journals that are open access only, there are some traditional journals that offer an open access publishing option. Some people have very strong opinions about open access, in my opinion it depends on the situation and your specific goals. Is it important to you that the interested public and stakeholders of your issue can read the paper regardless of whether they have University library access? If so, shoot for open access. If your paper is technical and primarily of interest to specialists in your discipline, open access might be less of a priority for you. Some journals (traditional or open access) offer publication fee waivers for students. In general, these fees should be paid by grants or departmental funds, not out of pocket. Some scientific journal editors send out manuscripts for peer-review relatively quickly after they are submitted, and request that peer reviewers complete their reviews quickly. Other journals… move less quickly. My Masters research was in review for over 3 years before it was eventually accepted. It can often take more than a year from submission to publication, particularly for longer or more novel or more controversial work. In general, doing a great job writing the paper the first time can reduce turnaround time as reviewers can focus on the science and not the quality of the writing.If you already have a job lined up, it may be worth it to you to wait longer to publish but get published in a higher profile journal. If you are finishing up grad school and applying for a job, you probably want to get the paper published as soon as possible so it can help you with the job search (and you don’t want to worry about the paper anymore and can focus on your job). Submit your paper first to the highest-profile journal that could reasonably accept your paper that is a good fit for you in terms of theme/scope, audience, cost, open access policy, and turnaround time. If you get rejected from that journal, submit to the second highest-profile journal that could reasonably accept your paper that is a good fir for you in terms of theme/scope, audience, cost, open access policy, and turnaround time. Or, just submit to a journal that will probably accept your paper pretty quickly. The thing that surprised me most about scientific publishing is how long it takes to actually submit your paper after your manuscript has been written and you’ve identified a target journal. This can easily take half a day, and may take even longer. Journals have very specific preferences concerning manuscript formatting, which are detailed on the journal website’s “instructions to authors.” These instructions range from the reference formatting discussed above to font sizes of subheadings and figure captions and page numbering and whether to capitalize species common names. Sometimes the figures and tables are included at the end of a manuscript as part of the same file, sometimes they are separate files. These guidelines need to be followed very closely, papers can be rejected before even making it to peer review if they aren’t formatted properly. You’ll be asked to add some keywords at the time that you submit. In addition to helping to assign your paper to an appropriate editor and peer reviewers, these can help potential readers to find your paper later. The list of keywords should be both general and specific. They should include the method you used, the study animal you used, the geographic region you studied in, etc. Basically, you want someone later searching for any of these issues to be able to easily find your paper. You are usually asked to suggest potential peer reviewers. An editor of a general ecology journal probably doesn’t know 5 people offhand who study shark feeding ecology using stable isotope analysis, while I, as the author of a paper on shark feeding ecology using stable isotope analysis, do. In general, you should suggest people knowledgeable about the topic of the paper, but a super-busy world leader in your field is probably going not going to have time to review the paper. It is totally ok to suggest a graduate student, as a graduate student I’ve been asked to review well over a hundred papers (I have reviewed about 40). You should not pick someone who you’ve collaborated closely with in the past as this presents potential conflicts of interest. You can also request to have a specific person not review your paper, but do this sparingly as it makes editors suspicious. If you request for someone not to review your paper, provide a specific reason, and “I don’t think they like me” does not count. Once you’ve gotten everything (cover page, cover letter, manuscript, figures, tables, etc) together and formatted appropriately, upload them and tell the system which file is which using drop-down menus. 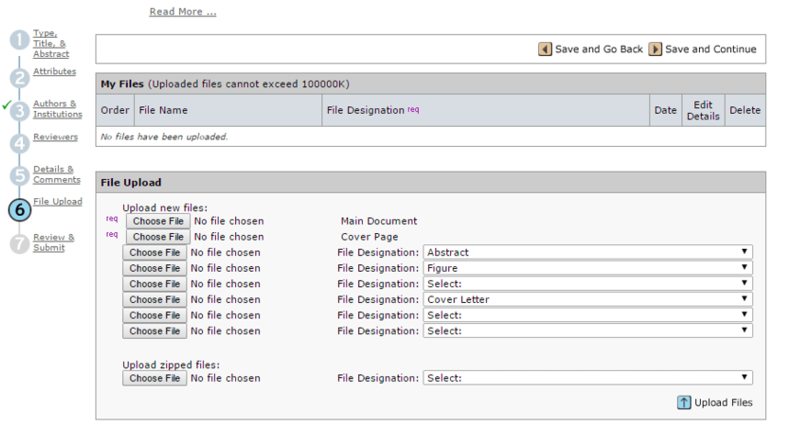 This will create a .PDF of your manuscript, which is exactly the file that your peer reviewers will see. Be sure to preview the .PDF before submitting it, sometimes there are issues converting from Word to .PDF and you want to make sure that peer reviewers see the correct information. Once you’ve uploaded everything completed everything on the checklist, click submit! It is important to note that this does not mean that you’ve successfully published a paper! After you submit your paper, it’s a waiting game. You can check on the status of your paper online, and can follow-up with the editor via e-mail (do this sparingly). The editor can choose to reject your paper initially, or to send it out for peer review. Peer reviewers will make specific (ideally constructive) comments about the paper, along with a recommendation. You need to be able to tell actual constructive comments from comments that are just about preferred voice and style, or those that are otherwise not particularly helpful. The recommendations include “accept this paper exactly as it is” (this is very rare), accept with minor edits, accept with major edits, reject but encourage resubmission, or reject outright. The editor will compare recommendations made by the peer reviewers and make a recommendation of his or her own, which will be shared with you along with the specific suggestions that the reviewers make. Sometimes it can be brutal to read these comments, I strongly recommend reading them and then waiting at least a day before starting to respond. It is possible to ask an editor to reconsider their recommendation, though this rarely works in practice- be sure to be polite, professional and specific. 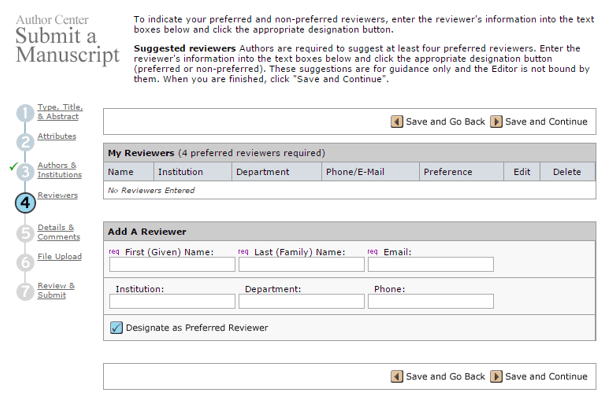 You should edit your paper based on peer reviewer comments. You should document exactly what changes you make in a new cover letter, along the lines of “Reviewer 1 said we should do X, so we did X in Y way,” etc. Include line numbers and specific quotes of what the passage used to say and what it says now. This means that your resubmission cover letter may actually be longer than your actual manuscript. You can also say that “Reviewer 1 said we should do X, we did not do X, here is why we didn’t do X.” You should do this sparingly. It is important to note that more often than not, the same reviewers who provided initial feedback will be asked to look over your changes, so you should be polite and appreciative even if you think they said something not particularly helpful. Once you’ve made all the changes, resubmit your paper the same way you initially submitted it. Please note that if your paper is rejected and you submit it somewhere else, you should still make the changes that reviewers suggested, it is possible that the same reviewers will be asked to review the paper again with the second journal. Eventually, possibly after several rounds of this, your paper will (probably) be accepted!